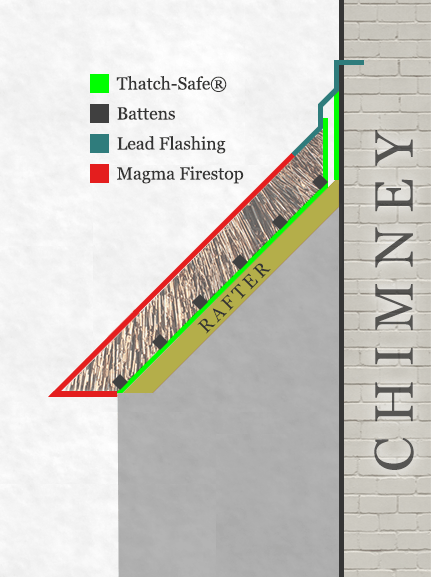 As we can from the diagram, the Thatch-Safe® Model Plus has all the benefits of the Thatch-Safe® Model, plus the Magma Firestop treatment to the top of the thatch which gives an A rating for spread of flame. This means it gives added protection in the event of a fire hazard such as sparks from a chimney, bonfire, fireworks or other external source. Roofs treated with Magma Firestop can benefit from reduced insurance premiums of up to 10%, as well as the peace of mind. The recent work by forensic investigators on Causes of Thatch Fires identified 66% caused by ejected embers from chimneys. Magma gives an A rating for spread of flame so reduces the risk of a fire starting in the first place. For more help with this or any other enquiries related to thatch, planning or fire retardants please contact us for free, no obligation advice.